It's become the "new normal" watching Spain's yields hit new highs on a daily basis. It's an unsustainable process and Spain is now fully shut out from the capital markets. Spain's CDS spread hit a new record as well this morning - now at 645bp. Just to put things in perspective, Banco Santander (Spain's largest bank) CDS trades at 474bp and Banco Bilbao Vizcaya Argentaria (Spain's second largest bank) CDS is 492bp. Both trade tight to the sovereign. The market views the banks (who by the way rely on the ECB for most of their funding) as being financially safer than their government. 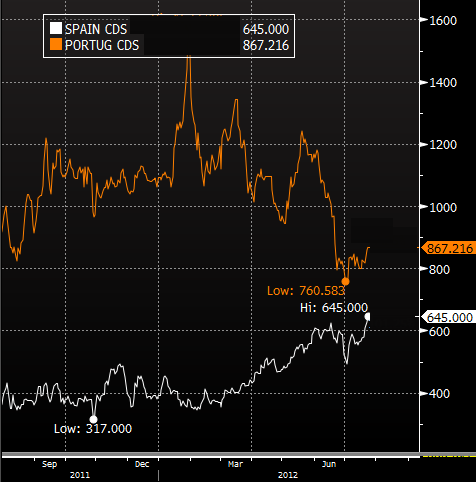 In fact Spain's CDS is pushing toward Portugal's levels as the perceived risks of these two nations begin to converge. Update: see a good comment (below) on the topic from Kostas Kalevras.